Alexander C. Cook, The Cultural Revolution on Trial: Mao and the Gang of Four Cambridge: Cambridge University Press, 2016. xv, 277 pp. ISBN: 9780521135290 (hardback). Cook interprets the trial through the lens of “transitional justice,” a legal term that appeared in the 1990s to describe the move away from authoritarian regimes in Latin America, Eastern Europe, and elsewhere. Although the term was not used by Chinese at the time, state media did present the trial as a way to address China’s recent political turmoil and pave the way for a better future (22-23). However, unlike other examples of transitional justice, the Gang of Four trial produced inconclusive results. Cook sees the trial as continuing the debate between scientism and humanism that had dominated China since the late nineteenth century. Whereas the scientist perspective blamed the Cultural Revolution on corrupt individuals in positions of power, the humanist critique traced the Cultural Revolution to a lack of human values in politics (34). Scientism and humanism, represented in Cook’s account by legal and literary narratives, were both efforts to define China’s post-Mao era, but scientism became the dominant discourse. The result, Cook believes, was a socialist China devoid of its revolutionary soul (231). Chapter 1, which covers the indictment, details the process by which the trial evolved from being a “settling of accounts” (算账) to becoming a case of transitional justice. Between 1976 and 1980, while the CCP was engaged in behind-the-scenes deliberations and Deng Xiaoping secured power, the meaning of “gang” (帮) evolved from describing “factional cliques” (小宗派) (44) into the “gang” of the Gang of Four—a “counterrevolutionary criminal syndicate” responsible for persecuting 729,511 people and killing 34,800. Departing from the violent accusations that characterized the Cultural Revolution [i.e., “criticism and struggle” (批斗) and “speaking bitterness” (诉苦)] (36), the finalized indictment, which went through thirty revisions, turned to 法 (law) to complete a narrative that undid the recent past through “new ways of thinking law, speaking law, and performing law” (想法, 说法, 做法) (39). When the indictment was delivered on the opening day of the trial, November 20, 1980, its authority rested on a legal order rather than moral values. The public reading of the charges in the special courtroom, located at No. 1 Justice Road, constitutes another element of Cook’s literary reading of the indictment. Cook analyzes the layout of the courtroom, the proceedings of the trial, and the audience’s visceral antagonism toward Jiang Qing: “seeing her performance really made you want to vomit,” wrote one reporter (73). While such details are illuminating, readers might wish that Cook had speculated further on why Jiang Qing was viewed in such a negative fashion and how the trial (especially her testimony) functioned as a performance. What might be some of the possible factors contributing to the audience’s condemnation of Jiang Qing’s manner, other than the fact that she was a woman and used to be an actress? Did the audience also employ a concept of “law” to create a popular form of indictment, such as a law of viewing and a law of reading (看法, 读法)? Cook demonstrates how the “account” that the indictment aspired to settle could not be fulfilled by a single legal document. It left a vacuum for the “literary indictment” (80) to probe and question. Chapter 2 analyzes one such literary indictment—Liu Binyan’s Between Man and Monster (人妖之间 1979), a celebrated work of reportage that exposed corruption at a state-run coal-mining enterprise in Heilongjiang. Cook’s grounds for pairing Liu’s book and the court’s indictment are three-fold. First, he identifies reportage as a literary genre in which “seeking truth from facts” (实事求是) is the guiding rule. Second, Liu’s investigation into government corruption spoke to the post-Mao reformers’ diagnosis of the Cultural Revolution as “a willful ignorance of real social conditions” (90). Finally, similar to the legal indictment, Liu’s reportage critiqued the Cultural Revolution’s mode of truth claiming in which “truths were based on paranoia, distortion, and lies” (90). Although both the literary and legal indictments drew on “facts,” Cook finds Liu’s literary approach less optimistic than the legal response. Between Man and Monster identifies misrule by monsters, not criminals, as the problem behind the Cultural Revolution. Wang Shouxin, the female official condemned in the work, is not only emblematic of the “monsters” that ruled during the Cultural Revolution, she is a stand-in for Jiang Qing (79). While the indictment hoped to “seal” the wounds of the Cultural Revolution with a concise legal statement and “court-drama”-like trial, Liu’s literary indictment “left no doubt that the wounds of the Cultural Revolution were not yet healed, and he harbored no illusion that recovery would be fast or easy” (98). Chapter 3 focuses upon the chief defendants’ testimonies, or methods of legal storytelling. Cook discerns four defense strategies: the confessional mode (adopted by Wang Hongwen, Chen Boda, and the generals linked to the Lin Biao case), contestation (Yao Wenyuan), silence (Zhang Chunqiao), and transcendence (Jiang Qing). While the confession and contestation modes entailed differing approaches, both appealed for “avoiding or mitigating punishment” by “weaving their own stories into the fabric of the larger trial narrative” (121). More threatening to the trial’s order was Zhang Chunqiao’s disinterested silence, which Cook reads as exposing the violence inherent in the courtroom ritual as well as potentially opening a new space that criticized the testimonies’ constraining force from within the legal proceedings (123). Such a silent protest, however, did not change the “tedious and un-dramatic” (107) tone of the inquiry, and the official press treated Zhang’s silence as an admission of guilt. The authority of the court was not sufficiently challenged until Jiang Qing appealed “from within the legal narrative to an authority without” (124). Speaking directly to a “personified History,” Jiang Qing asked, “If I am guilty, how about you all?” (126). By appealing to a higher kind of justice, Jiang Qing called into question the court’s authority to retrospectively put revolution on “trial” (126). In this manner, the “white-boned demon” not only became the embodiment of the Cultural Revolution, she was the Monkey King in her transcendence of law’s constraining force (127). That members of the public admitted “a begrudging respect for her defiant stand and acknowledge the validity of her claim” (129), suggests an inherent shortcoming to the persuasiveness of legal storytelling. Chapter 4 turns to Dai Houying’s novel Humanity, Ah Humanity! (人啊人, 1980) for a literary testimony that “contested the conception of a rational, impersonal, and objectively existing force of justice” (136) promised by the trial. Cook finds stylistic parallels between the multiple narrators in Dai’s work and the courtroom testimony of the trial (140-141). More important to Cook, though, is that Dai’s novel prioritized psychological interiority over plot and emotions over hard facts. By reviving the genre of psychological realism (141), Dai probed her characters’ interiority, or more precisely their individual and emotional reactions to everyday alienation (151). Readers during the post-Mao transition were shown that “a truly just reckoning with the past must take full account of the complexity and individuality of human emotions” (136). The actualization of transitional justice did not merely rely on a story of requital (the trial); it was also rooted in the equation of “human circumstances” with “emotions” (人情) (153). Through an inventive close-reading of the onomatopoeia “ah” in the book’s title, Cook traces this emotion/law dichotomy to the linguistic space between “empty” and “substantial” (虚/实). Cook strikes a contrast between the emotive, empty, and subjective connotations of ah against the carefully chosen words, or “shi (substantial, actual, real),” (158) that appeared in the legal testimonies. While such a reading is impressive, Cook’s interpretation of the novel, and literature in general, as the terrain of (private) emotion and irreducible complexity risks perpetuating narratives that prioritize the inward-turn of Western literary modernists’ writing in the first half of the twentieth century. This prioritization occasionally leads to an over-reading of the importance of ah in selected dialogues (161). Cook’s claim that Dai’s novel restored “to Chinese socialist fiction a psychological realism” that had been lost since the 1930s is also questionable, because it overlooks examples such as Ding Ling’s “When I Was in Xia Village” (我在霞村的时候, 1941). If the function of literature is to work out emotional “messiness,” then the trial was meant to erase such complexity, replacing ambiguity with definitive judgment. Chapter 5 covers the verdict—which, like the indictment, also went through thirty drafts (179)—as well as the June 1981 “Resolution on Certain Questions in the History of the Party since the Founding of the State.” Whereas the former announced the crimes of the Gang of Four as violations of statutory law (法律), the latter blamed the “decade of chaos” on the party’s lack of experience and violation of the objective laws of history (规律) (196). Notably, both the verdict and resolution aimed to bring into being new social realities (170). The trial redefined the violence of the Cultural Revolution from an issue of party discipline (纪律) to a matter of law, at the same time that the resolution elevated, or returned, the matter of law to the laws of history (197). Now that the trial and resolution had brought closure the Cultural Revolution, the CCP had regained its “scientific” focus and the “magic weapon” (法宝) of Mao Zedong Thought regained its “scientific” objectivity (200). The party’s ability to judge and thereby end the lingering effects of the Cultural Revolution is questioned in Chapter 6, which engages with Yang Jiang’s 1981 memoir, Six Records of a Cadre School (干校六记). The widely-read work, the first Cultural Revolution memoir by an established author, focuses on routine events that took place at a May Seventh Cadre School, a rural labor camp for sent-down urban intellectuals. Unlike “the sweeping verdicts of the party resolution and the court of law” that only “result in further dehumanization” (204-205), Cook finds in Yang’s multiple, fragmented, and incomplete accounts a narrative better able to reflect the complexities of the post-Mao transition (205). In his most convincing analysis of a literary text, Cook reads Six Records of a Cadre School in tandem with Shen Fu’s (1763-1825) Six Records of Floating Life (浮生六记). He deduces that the crucial yet missing piece Qian Zhongshu alludes to in the forward to his wife’s memoir is not the political campaign, which is deliberately excluded from Six Records of a Cadre School, but the shame (耻) that exists among all who experienced the Cultural Revolution (218). Drawing on Yang’s discussion of “waste”—she has been assigned the job of guarding the collected feces of the cadre school from being stolen by local peasants—Cook describes the Cultural Revolution as “a huge and ill-fated exercise in human resource management” (211). Yang’s narrative retains “a regretful ambivalence” toward socialism as an ideology (204), yet no ambiguity existed in the “coercive efficacy of the legal verdict or the party resolution” (225). 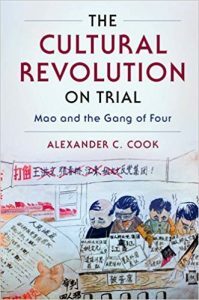 In contrasting humanity and legality, literature and law, individual interiority and collective agenda, Cook convincingly argues that legal discourse alone is inadequate in addressing the unresolved traumatic legacy of the Cultural Revolution. 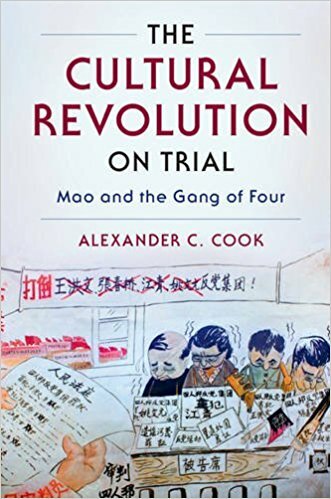 Early in the Conclusion, Cook observes that the trial reanimated a century-old debate in China: “Should modernization be motivated by instrumental rationality and material development or by humanistic values and spiritual renewal?” (227). His answer is that, while the trial attempted to establish instrumental rationality as the solution to China’s political problems, the humanist position continued to resonate in academic journals and sectors of the official media (232); the debate ended with the 1983 campaign against spiritual pollution, in which “the moral imperative of socialism was reduced to obedience to authority in the name of law and order” (232). Chinese socialism may have survived the Cultural Revolution, but “what remained was an official ideology bereft of positive values that people could believe in” (232). Cook unpacks the complexity of the Gang of Four trial and illuminates it as series of dichotomies—scientism/humanism, law/literature, rationality/emotion—through paired readings of legal and cultural narratives. However, readers might question whether the consistent emphasis on a dichotomy between legal/scientific and literary/humanistic perspectives suggests an unbridgeable gap between collective reason and individual emotion. Are scientism and humanism always at odds? Furthermore, while Cook’s dualism yields many insights, it nonetheless risks reductively characterizing early post-Mao literature as primarily concerned with the discharge of unmanageable emotions. A brief acknowledgement of the potential pitfalls of a binary methodology and some consideration of the alternatives it precludes would have been welcome, to this reviewer at least. Perhaps the literary works and the trial could be seen as working in tandem during the immediate post-Mao transition, facilitating comprehension of and creating discursive spaces for working through unresolved traumatic issues from China’s recent past. These remarks are not meant to suggest that there is a fundamental problem in the book’s conception. The Cultural Revolution on Trial: Mao and the Gang of Four is innovative in approach, reveals unknown facts about the trial, and offers engaging readings of the era’s key legal and literary texts. Cook’s attention to the linguistic, cultural, and political significance of the legal and literary narratives surrounding the trial will surely inspire further studies by historians, legal theorists, and literary scholars. “Transitional justice” is a legal method used to help societies recover from human rights abuses and social trauma. Cook delineates its chief features as “transition to a new era, punishment of wrongdoers, reconciliation and social stability, democracy and the rule of law, and hopes for creating the good society” (23). Cook grants that “official discourse on justice that surrounded the trial proposed an apparently paradoxical resolution to this [materialist vs. humanist] dilemma: that socialist values could find expression in instrumental rationality” (227).